Objective Lenses: DIN Infinity Corrected Optical System (ICOS) U. Plan Phase 10x, 20x, s40x and s100x oil objectives mounted in smooth-operating, ball bearing mounted, quintuple nosepiece. Eyepieces: 10x Widefield High Eyepoint eyepieces F.N. 22 are standard with a 19mm reticle mount. 15x and 20x eyepieces are available as an option. Also available - Widefield High Eyepoint 10x focusable eyepiece that accept 25mm reticles. Total Magnification: 100x, 200x, 400x, and 1000x. Specimen Stage: Ceramic coated right-handed (left-handed avilable upon request), flat top stage measures 171mm x 115mm and travels 78mm(X) x 52mm(Y). Ergonomically positioned coaxial drop down controls. Illumination: Your choice of 30 watt halogen Koehler illumination or LED illumination. 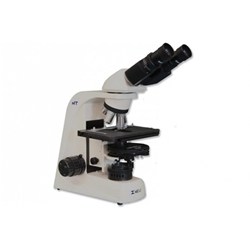 Each provides enhanced image quality and brightness for the observation of specimens and photomicroscopy. Light Focusing: Zernike Phase Condenser, NA 1.25 with centerable phase annuli for 10x, 20x, 40x, 100x with brightfield position and darkfield stop for 40x objective - in quick change dovetail mount. Binocular - 390mm (15.6") D x 410 (16.1") H x 210mm (8.3") W, 8kg (17.6 lbs). Trinocular - 390mm (15.6") D x 465 (18.3") H x 210mm (8.3") W, 8.7kg (19.2 lbs).